The digital era has utterly changed the way readers interact with the news. Traditional news outlets struggle to remain relevant as the media sector’s influence is refocused online. 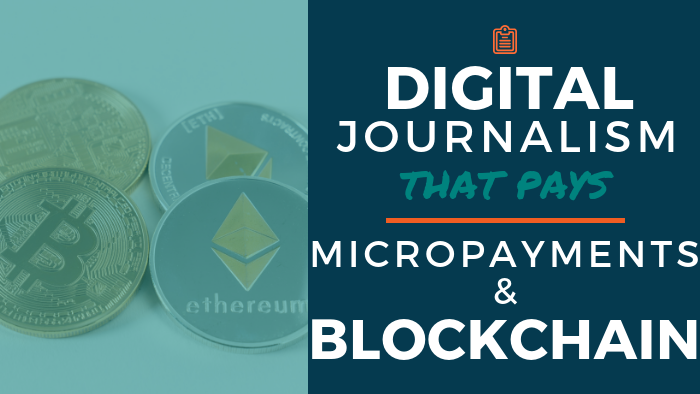 Journalism in the U.S. faces a number of challenges that blockchain technology has the potential to address and possibly solve — if the technology actually can achieve what it promises. 2018 itself has seen journalism move into uncharted waters as the industry comes up against issues, stemming from the continued digital migration of news organizations. Because blockchain functions as a platform to facilitate peer-to-peer transactions, there are a few news organizations that believe blockchain technology finally will enable micropayments to be widely adopted in the U.S.
At MIT Technology Review’s EmTech conference, Fang outlined recent work across academia that applies AI to protect critical national infrastructure, reduce homelessness, and even prevent suicides. One former Googler told Business Insider that the hiring of Moore is a “punch in the face” to those employees. The AI revolution is equally significant, and humanity must not make the same mistake again. It is imperative to address new questions about the nature of post-AI societies and the values that should underpin the design, regulation, and use of AI in these societies. This is why initiatives like the abovementioned AI4People and IEEE projects, the European Union (EU) strategy for AI, the EU Declaration of Cooperation on Artificial Intelligence, and the Partnership on Artificial Intelligence to Benefit People and Society are so important (see the supplementary materials for suggested further reading). A coordinated effort by civil society, politics, business, and academia will help to identify and pursue the best strategies to make AI a force for good and unlock its potential to foster human flourishing while respecting human dignity. Ethical regulation of the design and use of AI is a complex but necessary task. The alternative may lead to devaluation of individual rights and social values, rejection of AI-based innovation, and ultimately a missed opportunity to use AI to improve individual wellbeing and social welfare. The alternative is very different. In this world, AI reporters have replaced their human counterparts and left accountability journalism hollowed out. Facing financial pressure, news organizations embraced AI to handle much of their day-to-day reporting, first for their financial and sports sections, then bringing in more advanced scripts capable of reshaping wire copy to suit their outlet’s political agenda. A few banner hires remain, but there is virtually no career path for those who would hope to replace them ? and stories that can’t be tackled by AI are generally missed. Alibaba A.I. Labs’ general manager Chen Lijuan said the new robots aimed to “bridge the gap” between guest needs and their expected response time. Describing the robot as the next evolution towards smart hotels, Chen said it tapped AI technology to address painpoints in the hospitality sector, such as improving service efficiencies. Alibaba is hoping the robot can ease hotels’ dependence on human labour by fulfilling a range of tasks, including delivering meals and taking the laundry to guests. Launched at the Online News Association conference in Austin, Texas, the Future Today Institute’s new industry report for the future of journalism, media and technology follows the same approach as our popular annual mega trends report, now in its 11th year with more than 7.5 million cumulative views. Blockchain emerged as a significant driver of change in 2019 and beyond. The blockchain ecosystem is still maturing, however we’ve now seen enough development, adoption and consolidation that it warrants its own, full section. There are numerous opportunities for media and journalism organizations. For that reason, we’ve included an explainer, a list of companies to watch, and a cross-indexed list of trends to compliment blockchain technology. We’ve also included detailed scenarios in this section. The mixed reality ecosystem has grown enough that we now see concrete opportunities on the horizon for media organizations. From immersive video to wearable technology, news and entertainment media organizations should begin mapping their strategy for new kinds of devices and platforms. Artificial Intelligence is not a tech trend—it is the third era of computing. And it isn’t just for story generation. 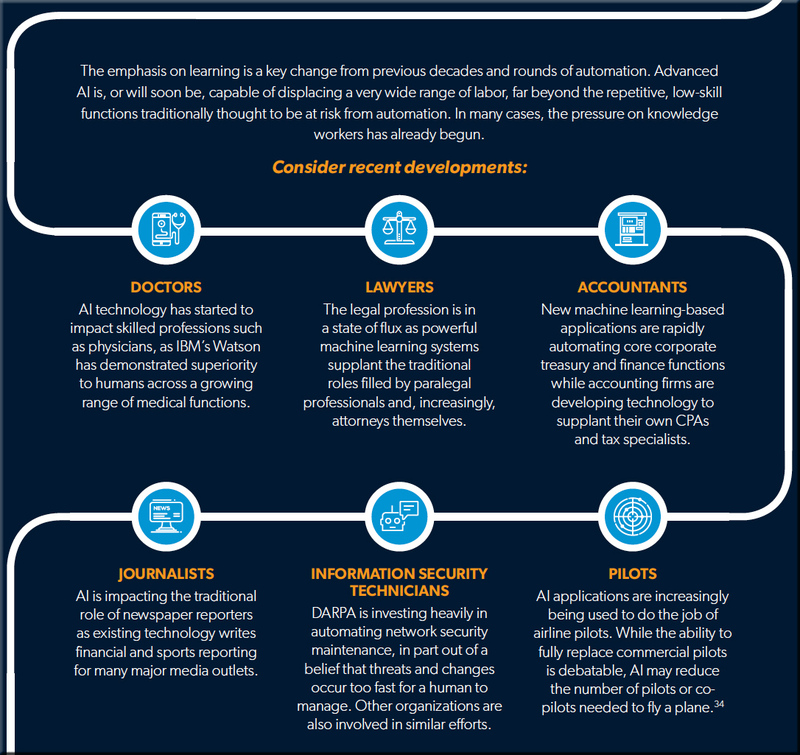 You will see the AI ecosystem represented in many of the trends in this report, and it is vitally important that all decision-makers and teams familiarize themselves with current and emerging AI trends. In addition to the 108 trends identified, the report also includes several guides for journalists, including a Blockchain Primer, an AI Primer, a mixed reality explainer, hacker terms and lingo, and a guide to policy changes on the horizon. The report also includes guidance on how everyone working within journalism and media can take action on tech trends and how to evaluate a trend’s impact on their local marketplaces. Download and read the full report here. 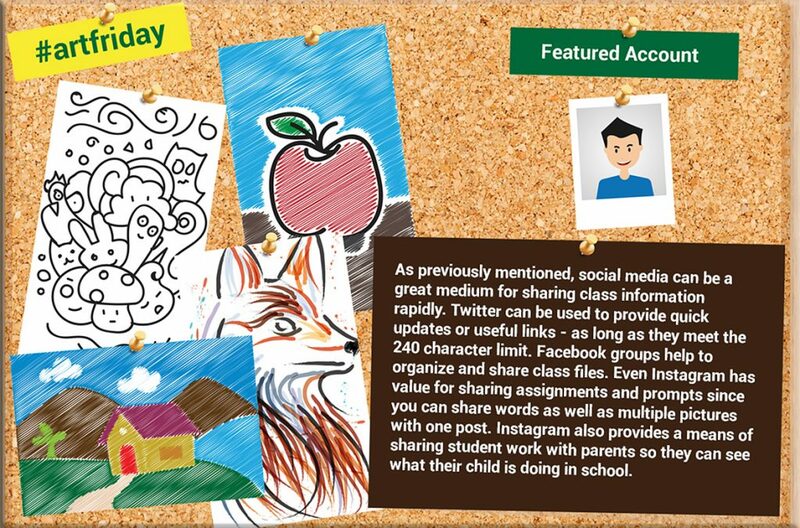 | View it on Slideshare. Technology has conditioned workers to expect quick and easy experiences — from Google searches to help from voice assistants — so they can get the answers they need and get back to work. While the concept of “on-demand” learning is not new, it’s been historically tough to deliver, and though most learning and development departments have linear e-learning modules or traditional classroom experiences, today’s learners are seeking more performance-adjacent, “point-of-need” models that fit into their busy, fast-paced work environments. Enter emerging technologies. Artificial intelligence, voice interfaces and augmented reality, when applied correctly, have the potential to radically change the nature of how we learn at work. What’s more, these technologies are emerging at a consumer-level, meaning HR’s lift in implementing them into L&D may not be substantial. Consider the technologies we already use regularly — voice assistants like Alexa, Siri and Google Assistant may be available in 55 percent of homes by 2022, providing instant, seamless access to information we need on the spot. While asking a home assistant for the weather, the best time to leave the house to beat traffic or what movies are playing at a local theater might not seem to have much application in the workplace, this nonlinear, point-of-need interaction is already playing out across learning platforms. Artificial intelligence, voice interfaces and augmented reality, when applied correctly, have the potential to radically change the nature of how we learn at work. As computer algorithms become more advanced, artificial intelligence (AI) increasingly has grown prominent in the workplace. Top news organizations now use AI for a variety of newsroom tasks. 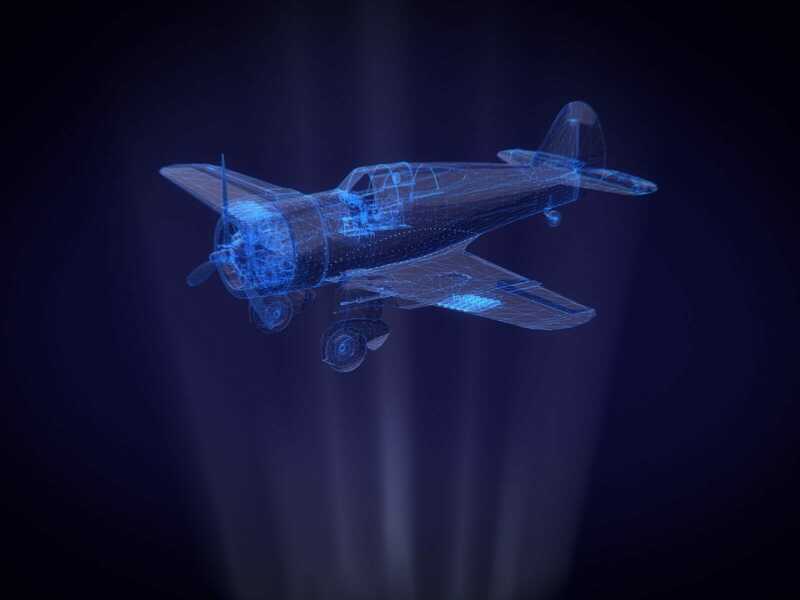 But current AI systems largely are still dependent on humans to function correctly, and the most pressing concern is understanding how to correctly operate these systems as they continue to thrive in a variety of media-related industries. So, while [Machine Learning] systems soon will become ubiquitous in many professions, they won’t replace the professionals working in those fields for some time — rather, they will become an advanced tool that will aid in decision making. This is not to say that AI will never endanger human jobs. Automation always will find a way. 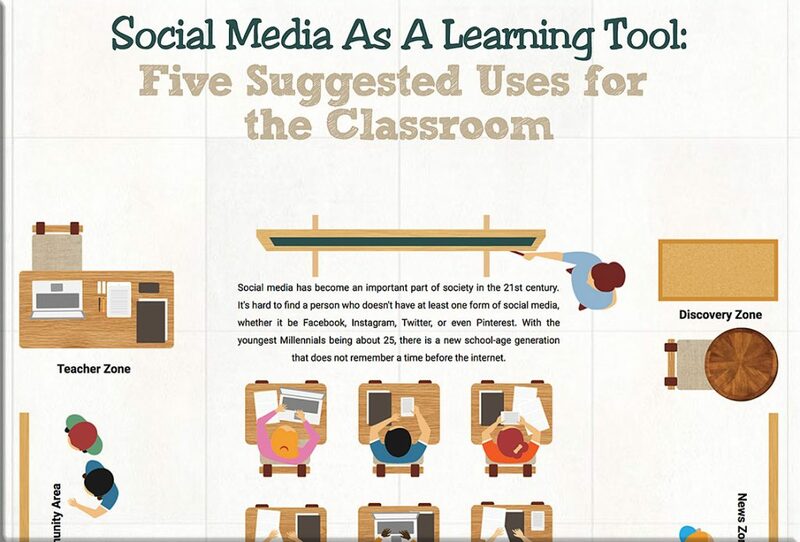 While I don’t find this article to be exemplary, I post this one mainly to encourage innovative thinking about how we might use some of these technologies in our future learning ecosystems. The work at the IQ Center offers a model for how other institutions might want to approach their own VR experimentation. The secret to success, suggested IQ Center Coordinator David Pfaff, “is to not be afraid to develop your own stuff” — in other words, diving right in. But first, there’s dipping a toe. The IQ Center is a collaborative workspace housed in the science building but providing services to “departments all over campus,” said Pfaff. 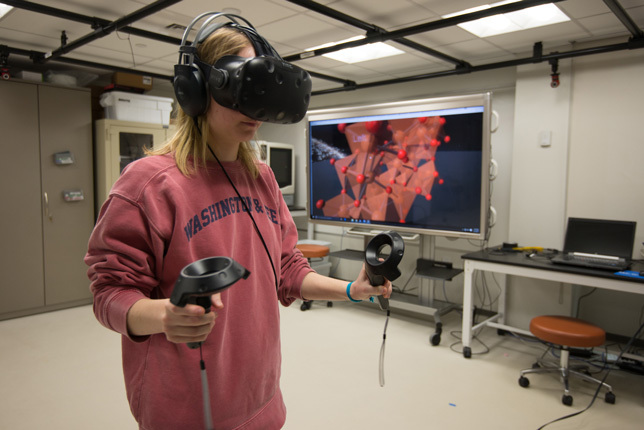 The facilities include three labs: one loaded with high-performance workstations, another decked out for 3D visualization and a third packed with physical/mechanical equipment, including 3D printers, a laser cutter and a motion-capture system. Here, I would like to stick to the challenges and opportunities presented by augmented reality and virtual reality for language learning. 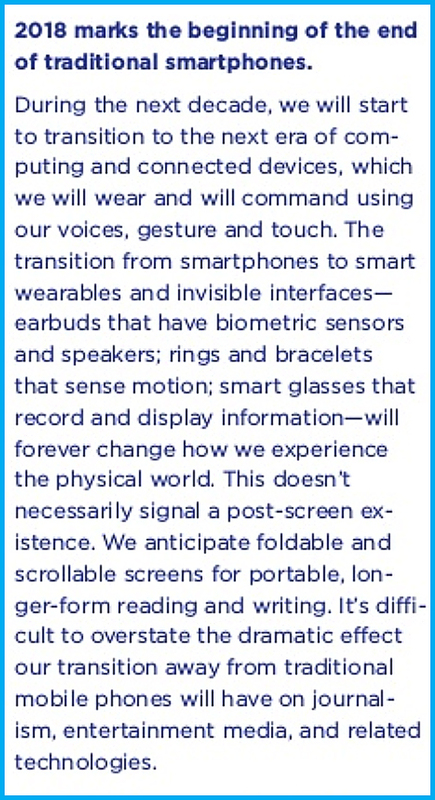 While the challenge is a significant one, I am more optimistic than most that wearable AR will be available and popular soon. We don’t yet know how Snap Spectacles will evolve, and, of course, there’s always Apple. I suspect we will see a flurry of new VR apps from language learning startups soon, especially from Duolingo and in combination with their AI chat bots. I am curious if users will quickly abandon the isolating experiences or become dedicated users. 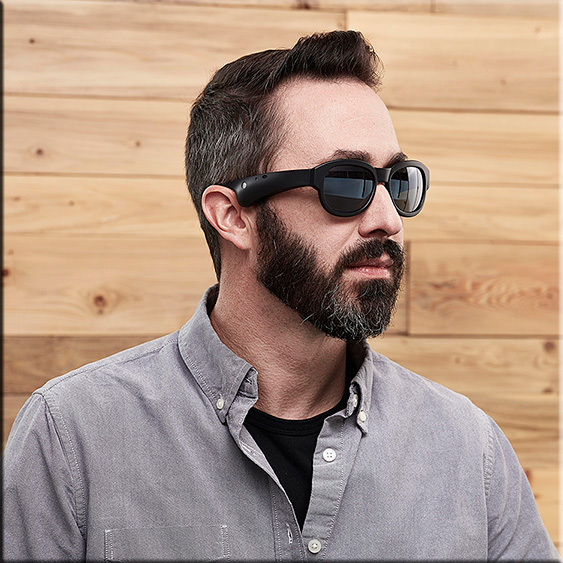 Best known for its speakers and headphones, the company has created a $50 million development fund to back a new AR platform that’s all about audio. For travel, the Bose AR could simulate historic events at landmarks as you view them — “so voices and horses are heard charging in from your left, then passing right in front of you before riding off in the direction of their original route, fading as they go.” You could hear a statue make a famous speech when you approach it. Or get told which way to turn towards your departure gate while checking in at the airport. Bose AR could translate a sign you’re reading. Or tell you the word or phrase for what you’re looking at in any language. Or explain the story behind the painting you’ve just approached. With gesture controls, you could choose or change your music with simple head nods indicating yes, no, or next (Bragi headphones already do this). 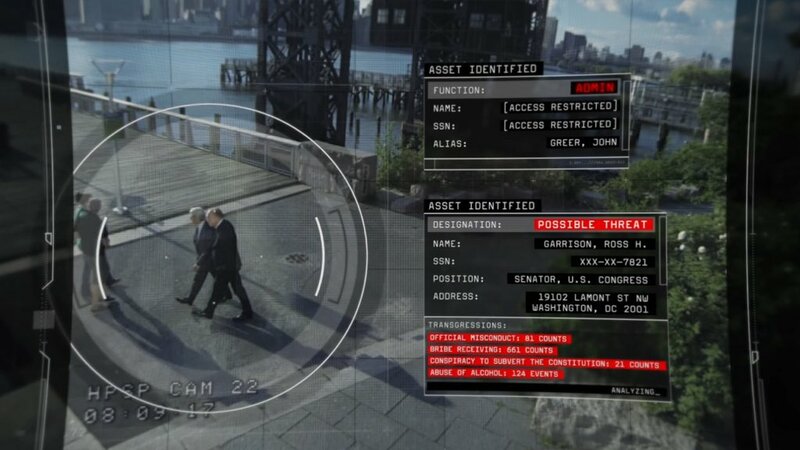 Bose AR would add useful information based on where you look. Like the forecast when you look up or information about restaurants on the street you look down. For example, you can add an event to your calendar from a photo of a flyer or event billboard, or you can snap a photo of a business card to store the person’s phone number or address to your Contacts. The eventual goal is to allow smartphone cameras to understand what it is they’re seeing across any type of photo, then helping you take action on that information, if need be – whether that’s calling a business, saving contact information, or just learning about the world on the other side of the camera. The World Economic Forum27 said in 2016 that 60% of children entering school today will work in jobs that do not yet exist. Regardless of industry, however, AI is a real challenge to today’s way of thinking about work, value, and talent scarcity. AI will expand and eventually force many human knowledge workers to reinvent their roles to address issues that machines cannot process. 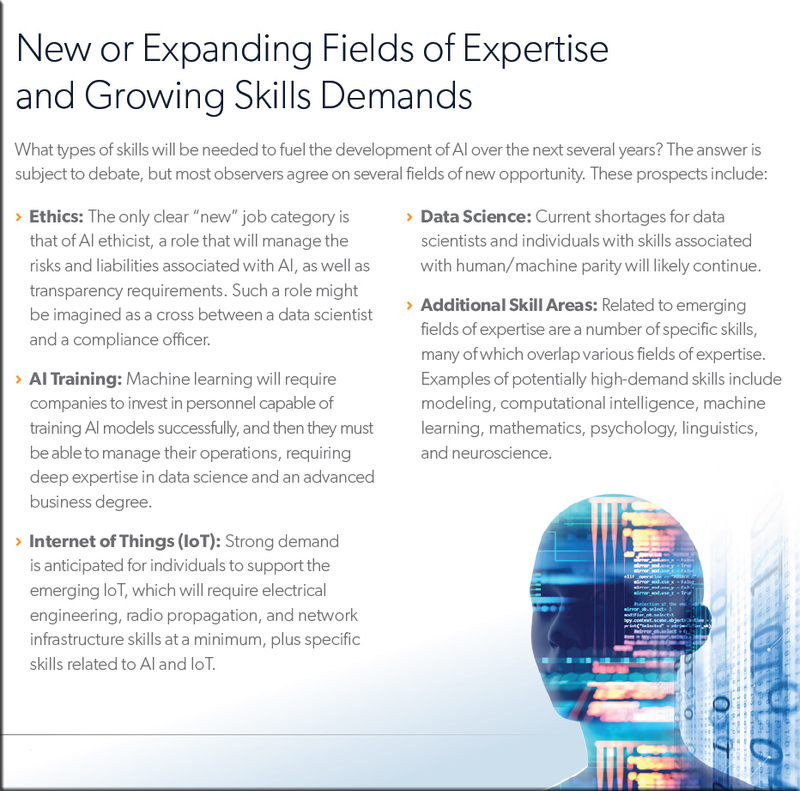 At the same time, AI will create a new demand for skills to guide its growth and development. 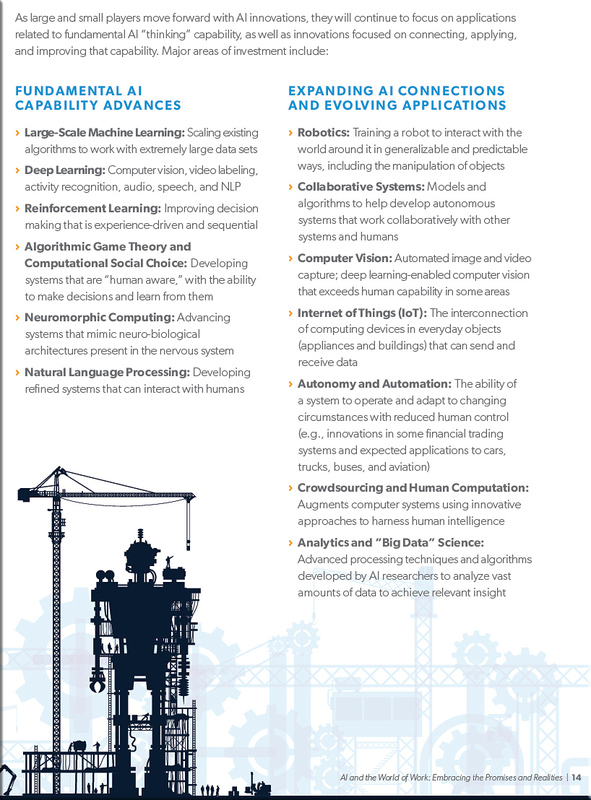 These emerging areas of expertise will likely be technical or knowledge-intensive fields. In the near term, the competition for workers in these areas may change how companies focus their talent strategies.